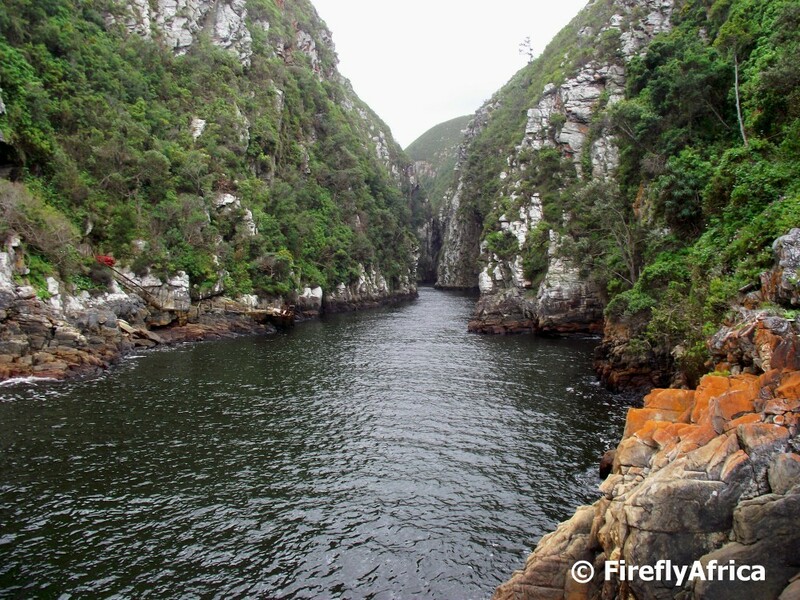 On the road to Morgan Bay on the southern Wild Coast you may just spot one of the most unusual and unexpected sights anywhere along a road in the province. A huge pink plane parked next to the road. The Convair 880, named Eish Airlines, belongs to Billy Nell, former Finance MEC of the Eastern Cape provincial government and stand son Morganville Farm. Nell had the plane towed to the farm from Bisho airport and now forms part of his collection of old bikes, automobiles and flying machines. The rugged coastline of the southern Wild Coast at Morgan Bay, an area I'm hoping to be able to explore a bit more next year some time. 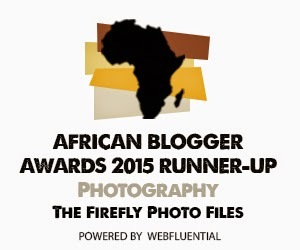 The Firefly Photo Files readers a Merry Christmas. 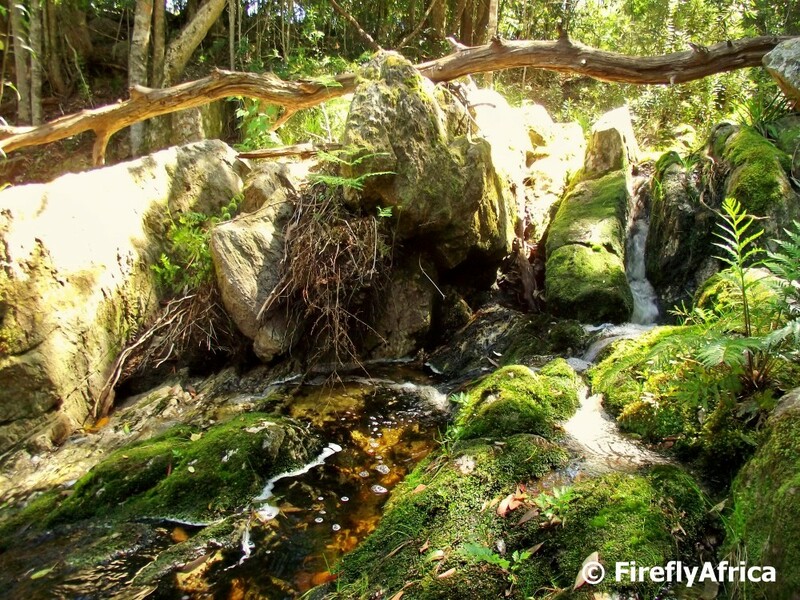 The Garden Route has many spectacular adventures that just about anybody can participate it. 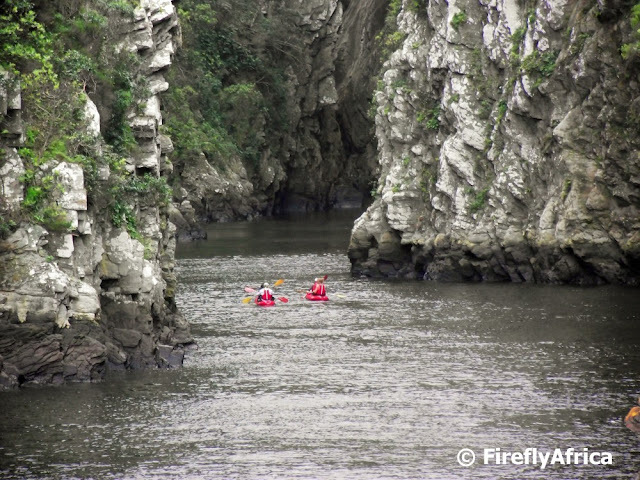 One of these is paddling up the magnificent Storms River gorge, starting at the suspension bridges over the river mouth. Just imagine the sheer cliffs of the gorge stretching up 100 meters on each side while leisurely paddling along. I seriously need to see if I can organise this trip for myself. I would love to do it. 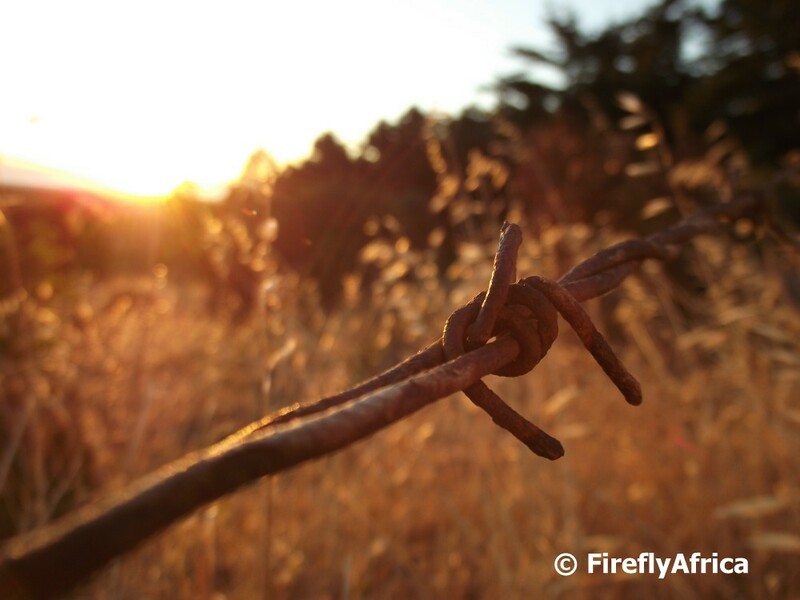 Barb wire at sunset. Its hard to believe that I took this pic in Noordhoek, Cape Town, a year ago during our Summer holiday and right now we are on our way (or already there depending on when you read this) for this year's vacation. The Klein Karoo with Montagu and Oudtshoorn awaits. 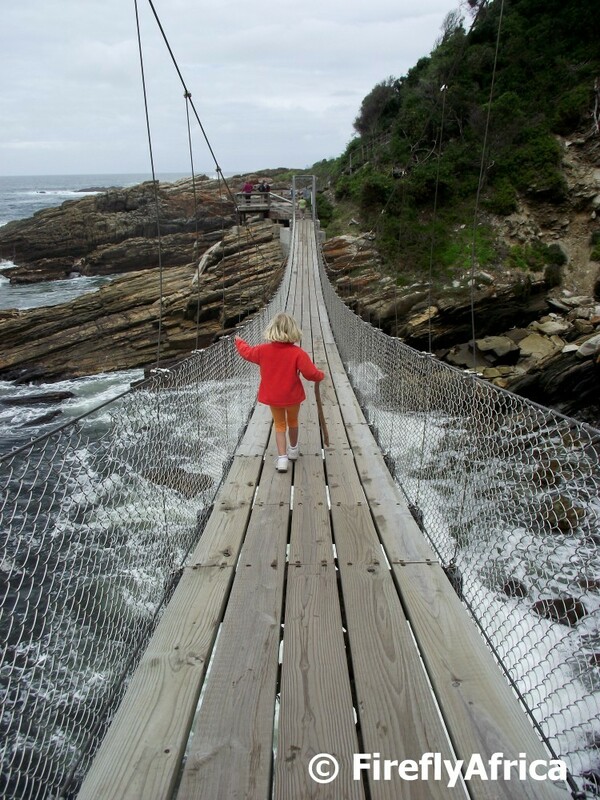 At first Drama Princess was a bit scared of crossing the three suspension bridges at Storms River Mouth but after going one way hanging onto me she was brave enough to walk back on her own. 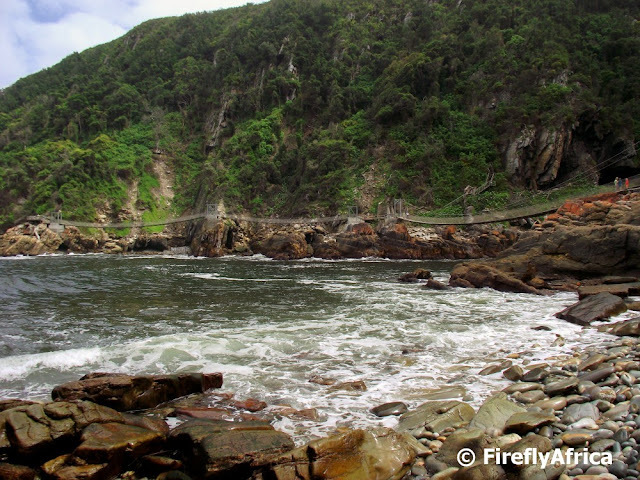 Storms River Mouth is truly spectacular. Over millions of years the river has carved a deep gorge down to the ocean and thus creates a very striking river mouth. It's this spot that are reached by taking the one kilometre Mouth Trail from the Tsitsikamma National Park's main rest camp. Over the years the suspension bridge over the river mouth has become a main feature in the park and pictures of it has become synonymous with Storms River Mouth. 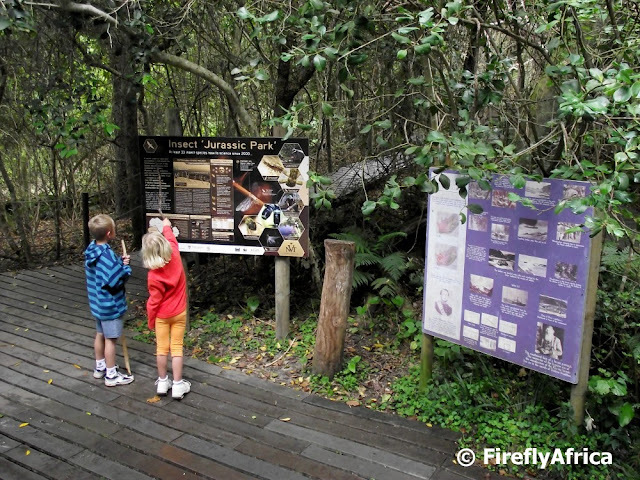 In 2007 a fire swept through the area close to the bridge and major damage was caused to the walkway as well as the surrounding environment. 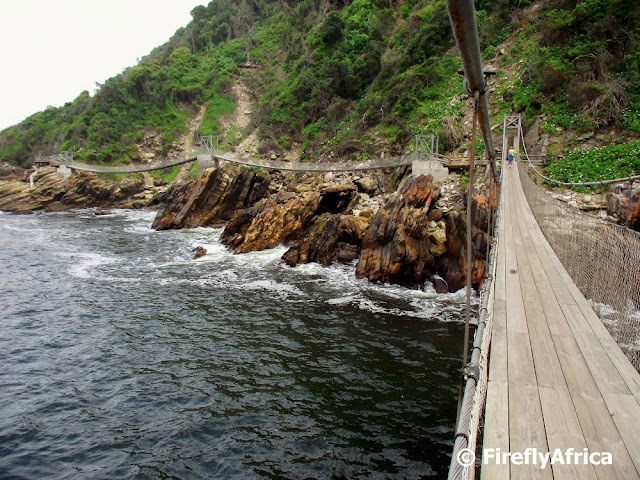 The rockface wasn't deemed safe enough to rebuilt the walkway and park management had to find another way to access the suspension bridge and subsequently further trails. The decision was made to built two further suspension bridges on the approach to the original bridge meaning that you now cross three before getting to the other side of the Storms River, giving one even more reason to walk the trail. Ek is mal oor lewer, maar nie almal is groot aanhangers daarvan nie. In die townships is dit wel baie gewild en word verkoop op baie straathoeke waar kos gemaak en direk uit die potte aan verbygangers verkoop word. 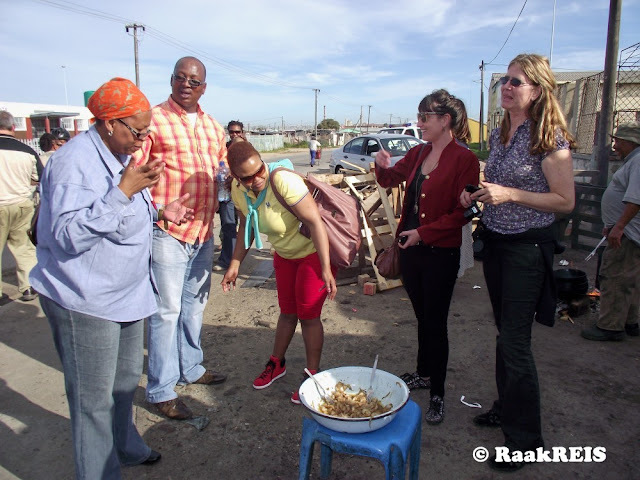 Onlangs het ek 'n toer vir 'n groep na New Brighton township in Port Elizabeth gereel en een van die stopplekke was 'n "wegneemete" hoek. 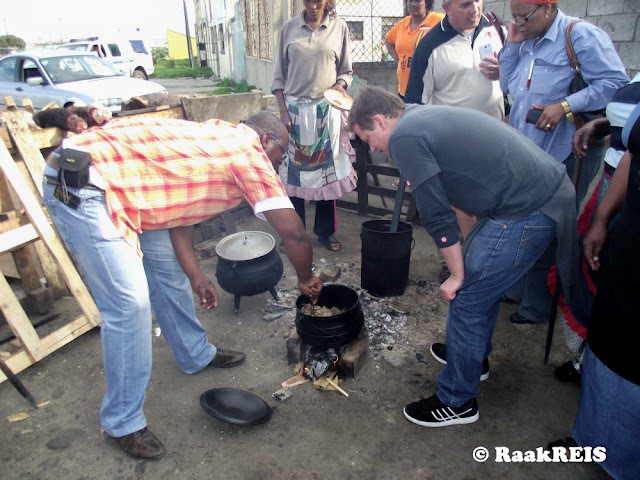 Hier het een van my kollegas 'n pot lewer en uie voorberei en alhoewel baie van die mense op die toer met opgetrekte wenkbroue daarna gekyk het het hulle gou ingespring en die bak leeggemaak. Ek het nog gehoop vir 'n laaste happie toe was daar net uie oor. 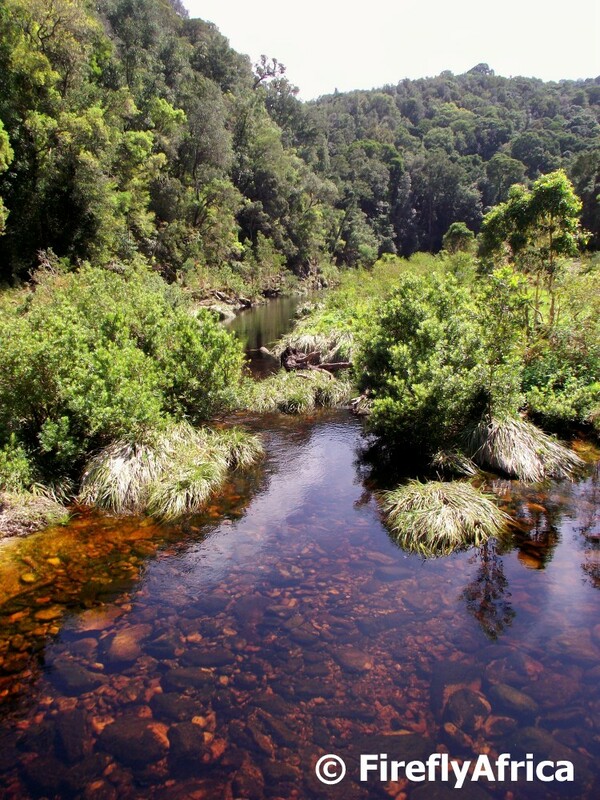 I can never rave enough on how awesome the Tsitsikamma National Park. Its an absolutely beautiful place and the amount of visitors, both domestic and international, that go there daily is proof that its one place you cannot miss when travelling along the Garden Route. 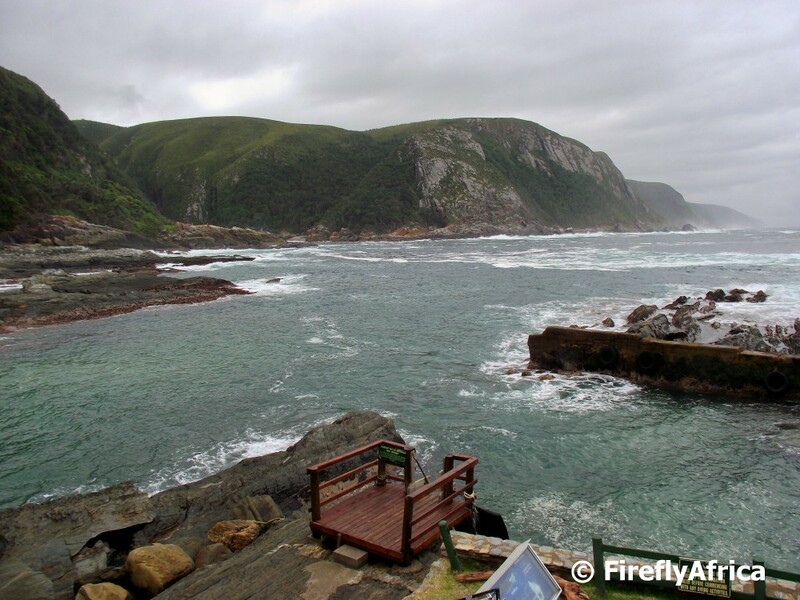 Most of these visitors do the Mouth Trail from the rest camp to the Storms River Mouth which is one kilometer away. One of my personal highlights of the walk is the stream that flows past very close to the start of the trail next to the beach. 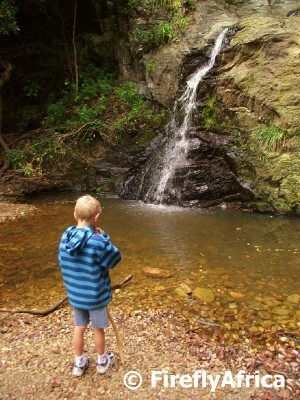 Drama Princess loves waterfalls and we first had to have a look at where it flows onto the beach. 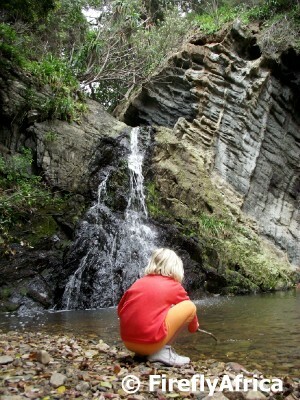 She then wanted to know where it came from, which was easy because the trail passes the stream just above. 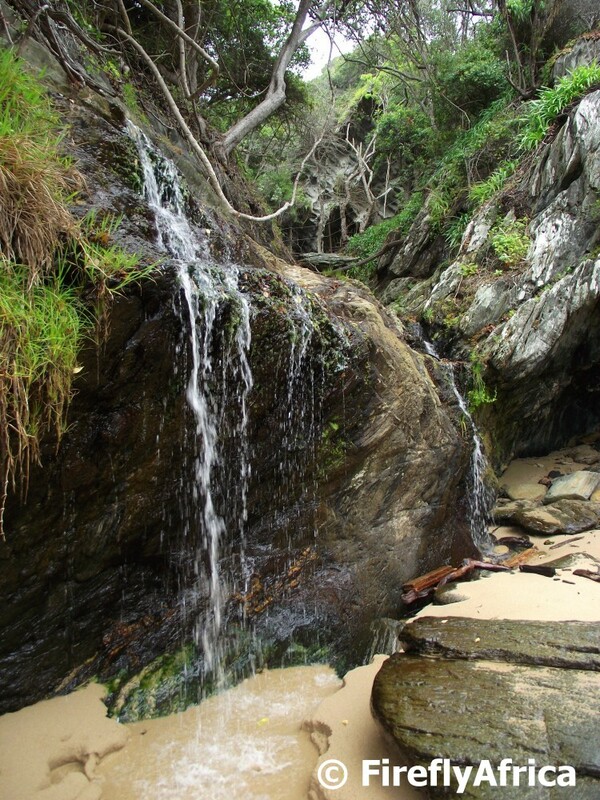 From the beach we headed onto the trail and stopped just below another waterfall the precedes the one on the beach. Honestly, I think if the Kidz had a choice they probably would have just stayed at the pool and played there, but there was so much more still to be seen and I had to chase them on. Also by now we were starting to fall behind the Damselfly who was well on her way towards the river mouth already. But another stop followed shortly after. The trail has an open air classroom where the history and ecology of the area are depicted on boards. 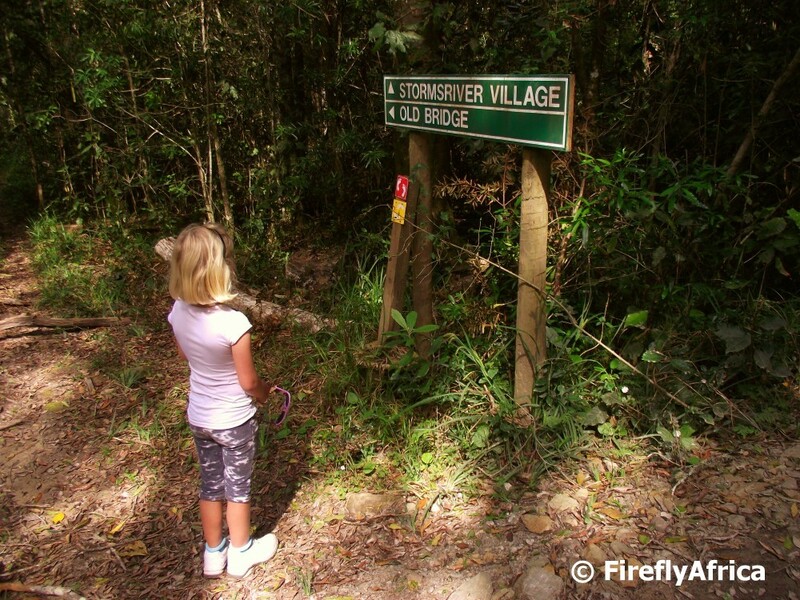 The Kidz wanted to have a look at what these first before we continued on to the suspension bridges waiting for us at the river mouth. More on that another time. I know that not everybody loves arum lilies like I do, but I just can't get enough of them specially when they grow wild somewhere in a forest or next to a stream. 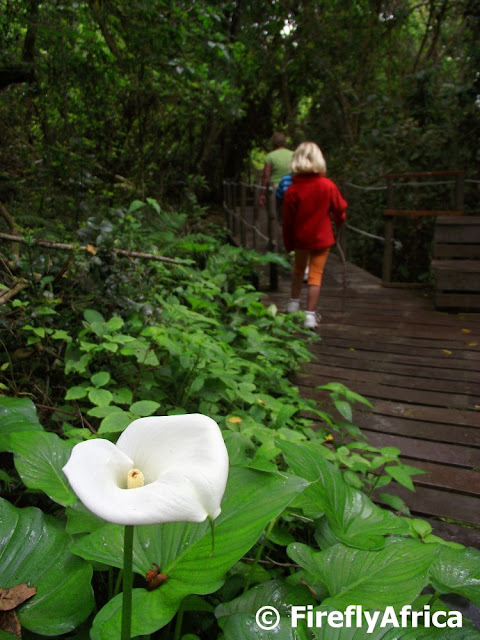 This one was growing next to the Storms River Mouth Trail in the Tsitsikamma National Park. The first part of our walk through the Plaatbos Nature Reserve took us on various trails through the forest before taking a halfway break next to the Storms River by the old low water bridge. 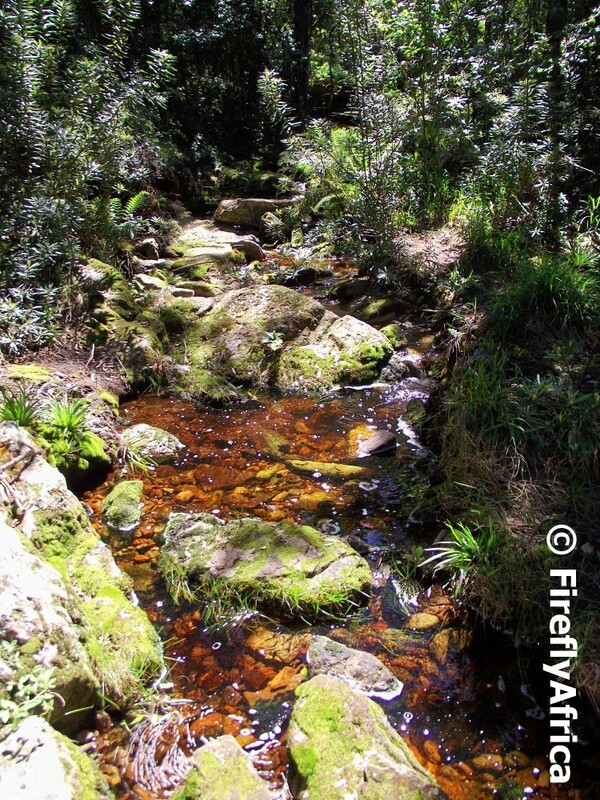 This left us with the walk back up to the village on the Storms River Pass. 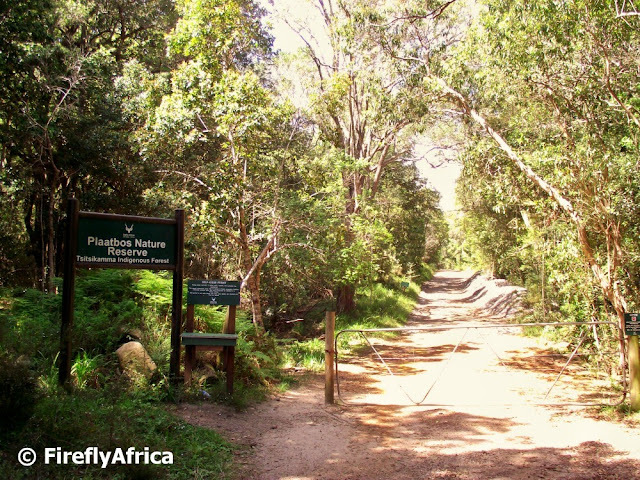 In 1879 the famous pass builder Thomas Bain was busy surveying the area east of Plettenberg Bay and found it to consist of almost impenetrable forests and deep river gorges. To get through the imposing Storms River gorge, Bain followed the ancient elephant trails which took the easiest and most gradual way down towards the river and built the road along those contoars. 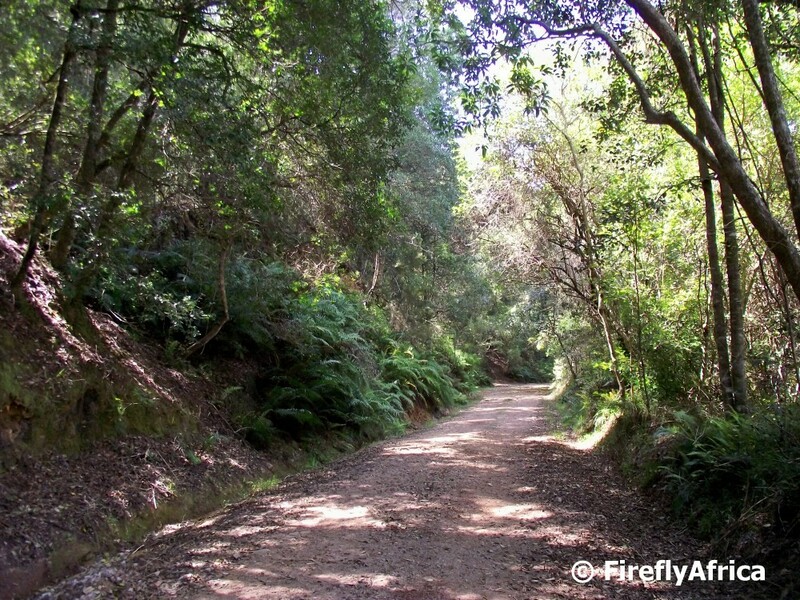 The pass was built by convicts and completed in 1884. Travelling down the pass some of those ancient trails can still be spotted next to the road. A kilometer or so before the end we crossed another stream and couldn't help stopping again for a break. 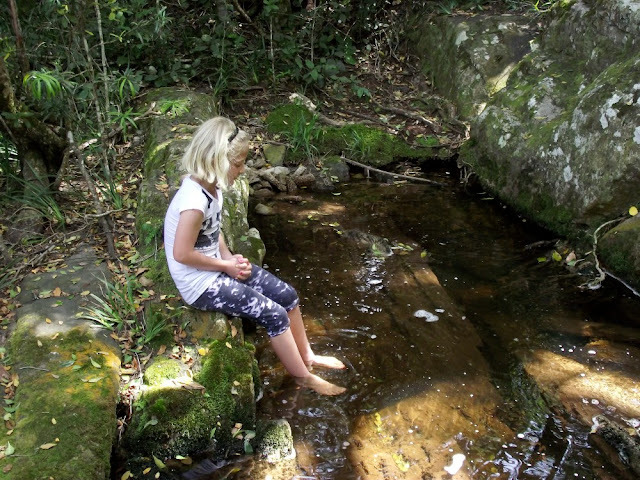 The Kidz had their shoes off immediately to enjoy the fresh forest stream. I took the opportunity to trek up and down the stream a bit for a couple of pictures capturing one of my favorite things - a forest stream. The end was in sight and nobody was complaining. It was an awesome morning out and we topped it off with ice cream sundaes at Marilyns Diner in the village. After a couple of hours hiking through the Plaatbos Nature Reserve we emerged from the forest close to where the old pass road crosses the Storms River. We headed straight down to the river, kicked off our shoes and soaked our feet in the cool, soothing water. Just what we needed at the halfway mark of our hike. When the pass was originally built the road went through the river with the low water bridge only being build by soldiers during the Second World War (I'm just trying to confirm this as I've only heard it somewhere before but can't find anything about it on the internet). 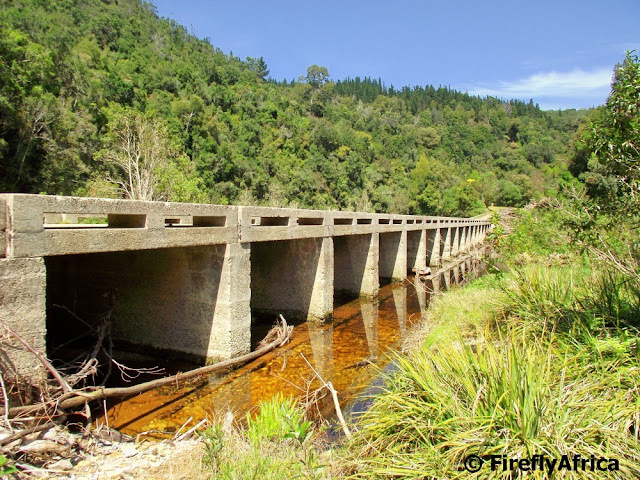 The pass was replaced by the N2 and the Storms River Bridge in 1958 and today the bridge can only be reach on foot, by bicycle or on the Woodcutters Journey tour done by Storms River Adventures. In the early days many travellers camped out next to the river after a "down day" (because the pass is so narrow ox-wagons could only travel either up or down the pass on any given day to avoid them coming face to face with another ox-wagon and have nowhere to pass each other). Just like they refreshed before the uphill trek, so did we. I find forests to have some kind of therapeutic effect on me, hence the fact that I will find any excuse to go and spend some time around forests. 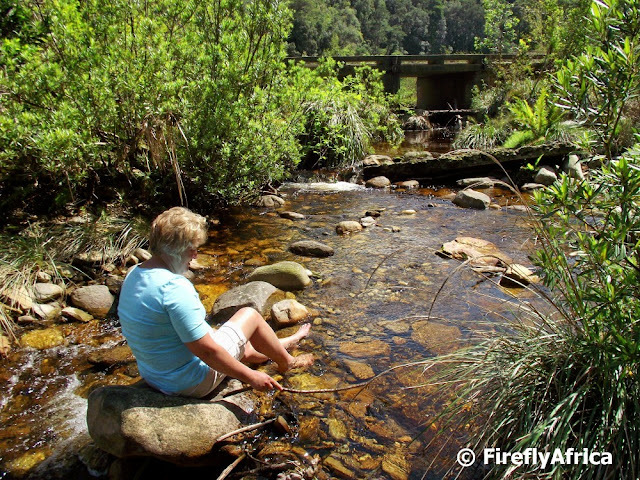 It's no surprise then that I found myself and Family Firefly on a family outing in Storms River Village in the Tsitsikamma. Three days around the forest for me is probably comparable to somebody from Gauteng spending a week at the beach. I did make it clear to the family that I wanted to spend at least (part of) one day doing a short hike in the forest and we decided on some of the trails through the Plaatbos Nature Reserve adjacent to the village. Plaatbos Nature Reserve falls within the Tsitsikamma National Park and has various hiking and mountain bike trails throughout, most branching off the old Storms River Pass. Heading into the forest we decided to take the very first one on the left as you enter the gate and disappeared into the forest. 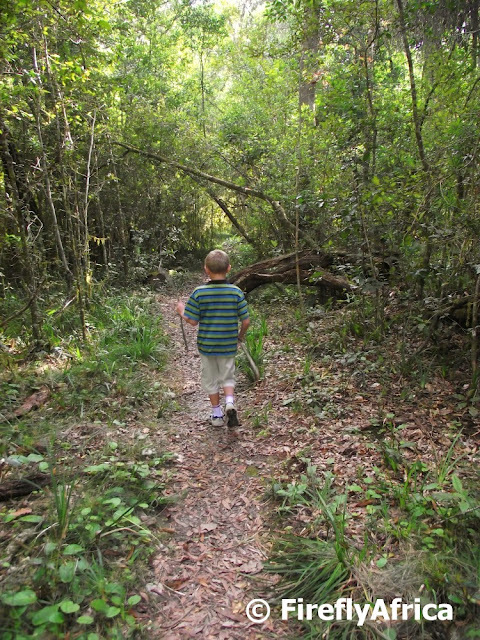 I'm very fortunate that my family loves the outdoors and don't mind going hiking, so as soon as we hit the trail Chaos Boy was off in the lead with the rest of us trailing after. 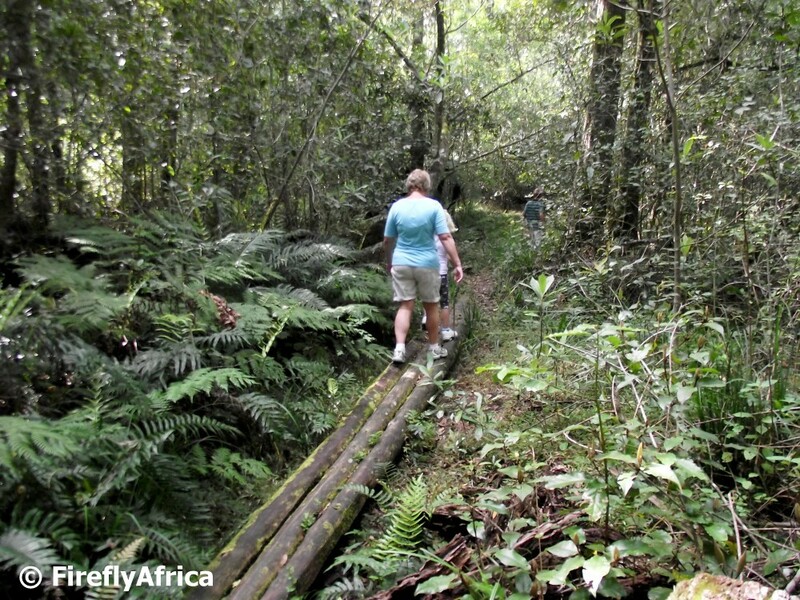 The trail through Plaatbos is a typical forest trail with very little disruption around other than the path itself. The initial plan was to just do a short loop but on two occasions we got to a fork and opted to keep going rather than head back towards the village. Most of the first part of the walk was spent right inside the indigenous forest and quite a few times I stopped to photograph something interesting. One of the things that always catch my eye is bracket fungus and on this walk there were no shortage of it. See Bracket fungus, Brown Bracket and Orange bracket fungus which I have already posted since our trip. In the end we spent about 4 hours in the forest covering what I guess was probably in the region of about 11 or 12 kilometers. But I'm getting ahead of myself. I decided to split the walk into three posts so that each covers a different part of our outing. I also didn't want to make it a too long a post cause there are many people like me out there who gets bored very quickly if one has to read too much. *smile* In the next post we head down to the historic Storms River low water bridge at the bottom of the pass. 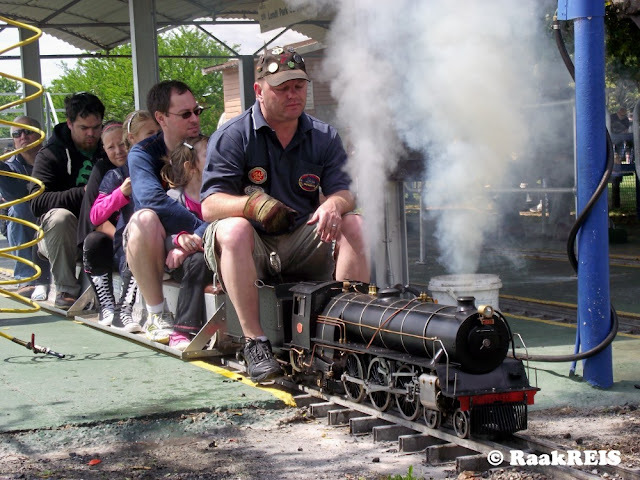 Op die eerste Sondag van die maand stroom baie families met klein (en ander met nie so klein) kinders na die Port Elizabeth Model Locomotive Society se maandelikse oop dag. Families staan al van vroeg af tou om op die treintjies te ry met veral die stoom lokomotiewe wat baie aftrek kry. Die rit vat wel net 'n paar minute, maar sluit in 'n tonnel, die Groot Grasrivier brug en 'n paar draaie deur die gronde in. En die beste van alles. Dit kos net ongeveer R6 per rit. 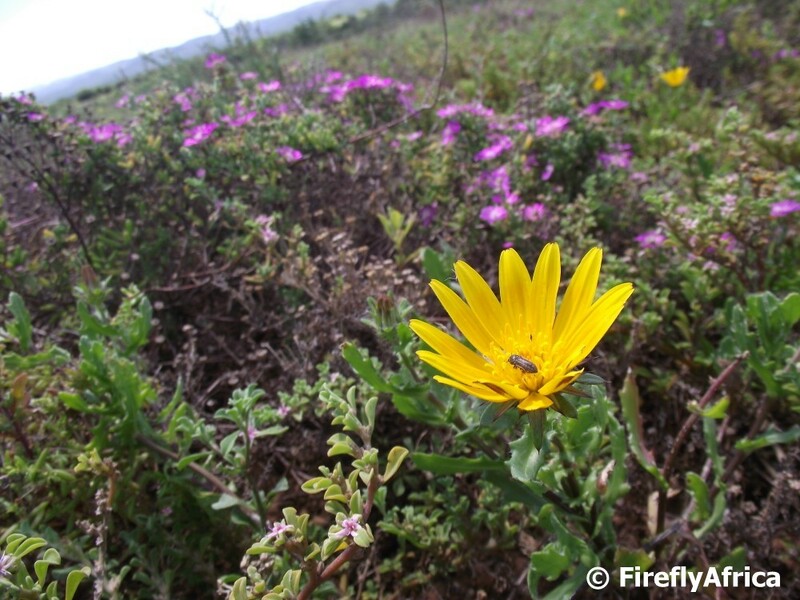 After the rains we had in the Eastern Cape this past winter the veld is looking really good. 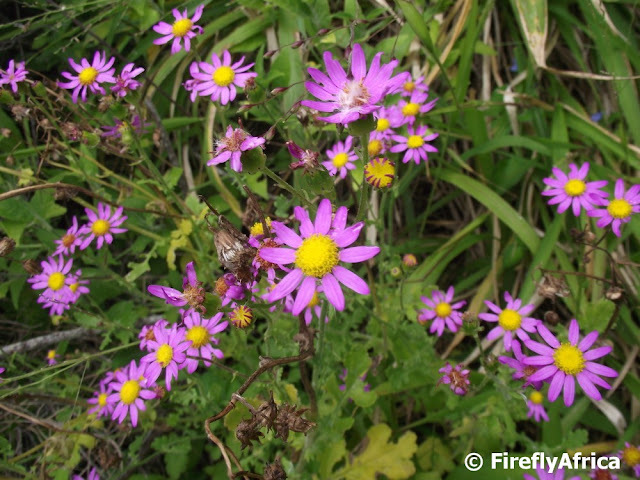 Its no different in the Addo Elephant National Park with lots of yellow and purple flowers all over.